Recently we had a dinner party in which Spring was the theme. For dessert, I made a sponge lemon cake with lemon curd filling (I will be posting that, hopefully tomorrow.) and decided that some candied violas on top would be a perfect accent. 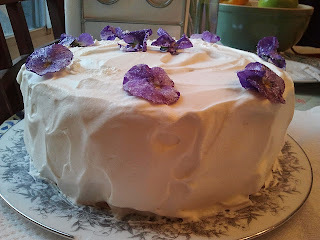 I was inspired by the Spring Celebration Cake in an old SPRING William's Sonoma book. 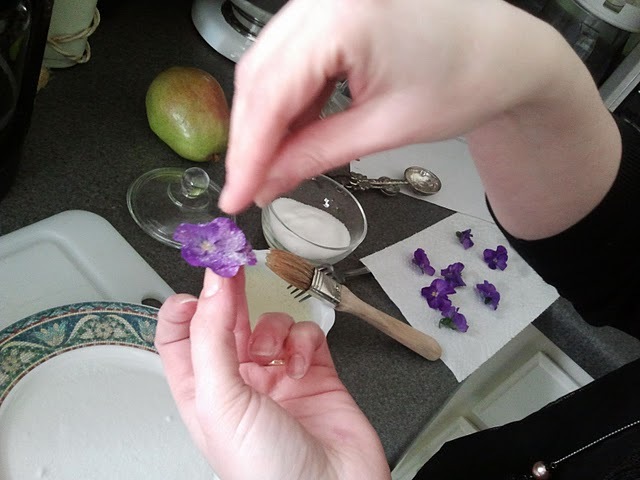 Sugaring the flowers is very easy. You just need to give yourself time to dry them out. 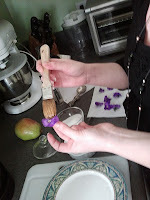 They can be stored between wax paper for a few days as well. The result is quite pretty! 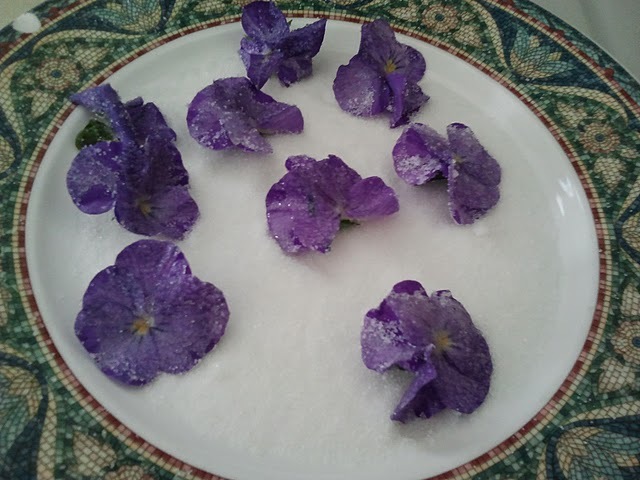 Here is also a pdf link of a short list of edible flowers you can use from Iowa Sate University: ( www.extension.iastate.edu/publications/rg302.pdf) Be careful, not all flowers are edible and all of them have various flavors that may not work for what you are using them for. Some have a more peppery flavor while others are sweeter and milder. So it is good to do your research before serving guests. 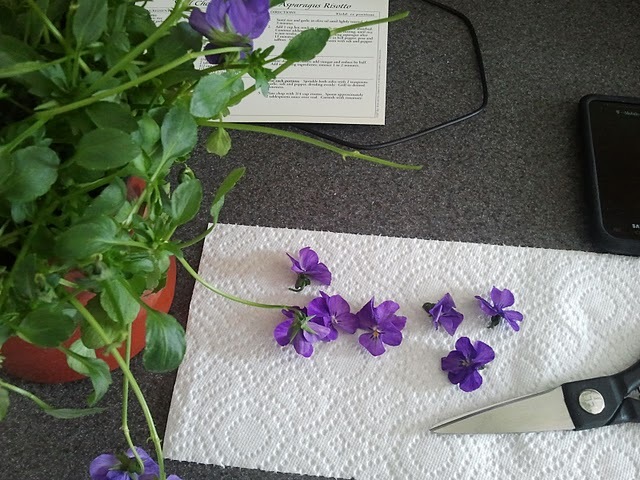 Gently rinse your flowers, lay them on paper towels to air dry for an hour or so. You may want to flip them midway so they dry evenly. 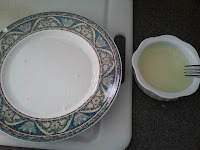 In a small bowl, whisk the egg white with the water until foamy. Set aside. In a flat plate, pour an even layer of granulated sugar, roughly 1/4 cup or so. This will be your drying area for the flowers. Reserve the remaining sugar for sprinkling. 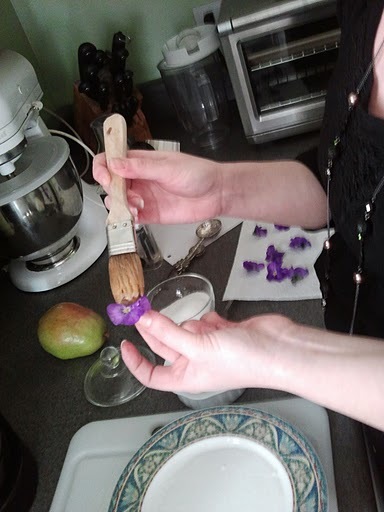 When the flowers are ready, take one in your hand and with the pastry brush, dip it in egg white and paint the front and back gently with the egg white. Use the brush to open petals flat and get a good shape. Only paint and sugar one at a time. With your fingers, sprinkle gently the sugar over the flowers until they are evenly covered and shimmer. You want an even, thin coating. Turn them over and sprinkle their backs the same way. Then check the front again, flattening out any petals that got bent forward. Lay the flower flat in the sugar plate. 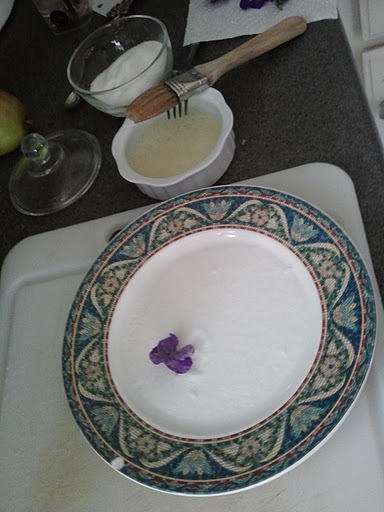 Continue with the rest of the flowers, letting them all sit in the sugar plate to dry completely in an arid, quiet place. This may take up to 2 hours or more. 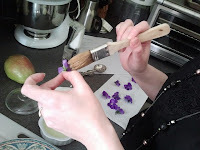 Flowers should be dry and brittle. I have heard you can speed things up by putting them on wax paper and putting them in a 200˚ oven for ten minutes. I have never done that, my worry has been that the heat would take some of the color and flavor out of the flowers. But if you are in a hurry, you can try it. Just don't forget them! Place them on your dessert as decorations when ready.